Here’s an Ali son who is building his reputation the hard way, he’s earning it! He’s had around 300 progeny born to Angus females with an average BW of 73 pounds. 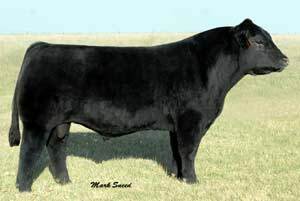 Smokin Joe was a good looking bull when he sold in the 2005 DeRouchey Sale, and now he’s become a powerful producer. Homozygous black. TH & PHA Free.